In 2004, the world was no longer able to deny the fact that they knew was true: McDonald’s, even the healthy choices, are absolutely horrible for you. Of course we all knew this, but it was Morgan Spurlock’s fascinating, slightly nauseating documentary Super Size Me that really drove the point home. The effects of the movie, in which Spurlock vows to eat only McDonald’s for all 3 meals for a 30 day period, were momentous both in terms of the consumers and the company. The low-budget, “experimental” film went on to win the Sundance Film Festival’s top documentary director award as well as get nominated for an Oscar. More than that, this film has been treated like a precious warning for future generations. Most impressive was McDonald’s response to the film. After news of the documentary was released, McDonald’s went into PR Crisis mode. The day before the documentary was scheduled to open, McDonald’s added the “Go Active” adult happy meals to their menu. Soon enough, even their advertisements were focusing on “healthier choices,” a trend that is still seen today. But perhaps most interesting is McDonald’s decision to remove the forever tainted option of “super-sizing” a meal from their repertoire. These were the first steps toward a gradual,long-anticipated revolution in the fast food world. It’s nearly 7 years later and Spurlock is about to release his second documentary, also at the Sundance Festival which is currently going on. 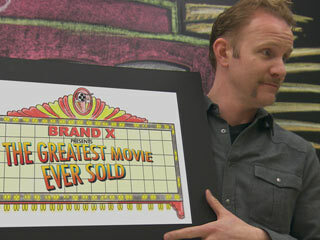 For his latest film, known as The Greatest Film Even Sold, Spurlock decided to investigate the world of product placement and brand integration. Spurlock quite literally financed this entire film, a $1.5 million venture, by contracted with 15 companies. Due to these contractual obligations, Spurlock decided to change the official name of the film to POM Wonderful Presents: The Greatest Movie Ever Sold (anyone else really craving pomegranate juice all of a sudden?). And the companies? The whole premise of the movie came from Spurlock’s distaste for the blatant, in-your-face product placements/integrations that plague television and film– wouldn’t the companies be the enemy? In the same interview, Spurlock responds: “The companies who were willing to come on board this movie wind up looking great because they had the balls to take part.” Proving, that the ability to laugh at oneself is an important key in both business (especially PR) and life. Morgan Spurlock’s documentary, which is already receiving warm reviews, can be expected to layer on the humor while also revealing a unique look at an interesting subject. I wonder what kind of effect this film will have on the marketing world?